Just as the Sun set on a DeKorte Park mud flat, Jersey City and lower Manhattan (on left in distance), and Laurel Hill and the Turnpike (on right in the distance) yesterday, so does the Sun set on 2008. Here's to 2009 and the dawning of a new year. 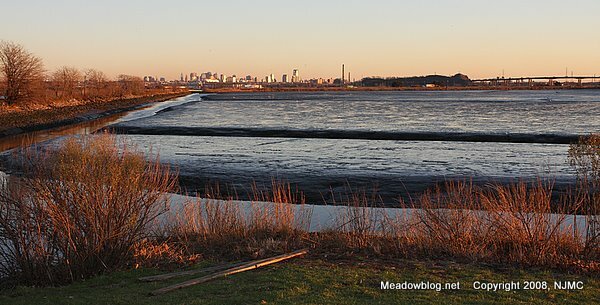 The Meadowlands Commission is kicking off 2009 with a Snowy Owl watch/DeKorte Park guided walk on Monday, Jan. 5. NJMC naturalist Mike Newhouse, who heads the popular Harrier Meadow walks, will be the leader. We will meet at DeKorte Park at 9 a.m. and, if the owls are still here, we’ll drive over to see them with spotting scopes and also look for Rough-legged Hawks (pictured above), Northern Harriers, and the local Redtails and Kestrel. Click "Continue reading … " for more information. This weekly feature is brought to you by the Meadowlands Commission's Parks Department to give you some historical background on how local places, landmarks, and geographical features got their name. 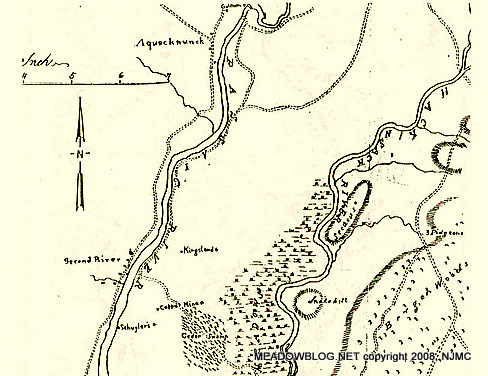 In 1668, Nathanial Kingsland and William Sandford purchased the peninsula between the Hackensack and Passaic Rivers, encompassing 10,000 acres of salt meadows and more than 5,000 acres of uplands, from the Lenni Lenapes. They paid: 170 fathoms of black wampum (fathom = 6’), 200 fathoms of white wampum, 19 black coats,16 guns, 60 double hands of powder,10 pairs of breeches, 60 knives, 67 bars of lead, One anker of brandy (1 anker = 10 gallons), 3.5 vats of beer, 11 blankets, 30 axes and 20 hoes. Birder-photographer Kevin Watson took several top-notch Snowy Owl, Northern Harrier and Rough-legged Hawk shots in the Meadowlands during the past week. 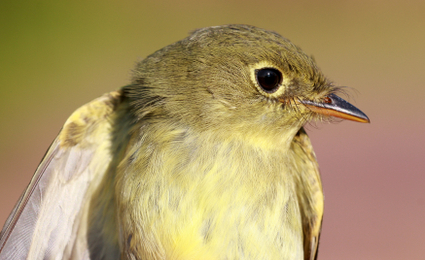 With all the fuss over the Snowy Owl(s), another recent arrival has gotten short shrift. A Eurasian Green-winged Teal (Common Teal) is in the tidal impoundment across the parking lot from the new science building and observatory in DeKorte Park in Lyndhurst. More on the Eurasian Green-winged Teal here. Several weeks ago, after a Snowy Owl was seen (and photographed) at Liberty State Park, New Jersey birders got into a lively debate about the wisdom (or lack thereof) of using flash photography when taking pictures of owls. Now that Snowy Owls have been seen regularly in the Meadowlands, the debate takes on a little more immediacy. We asked David Johnson, head of the Global Owl Project, for his thoughts. Click "Continue reading …" for more of David Johnson's comments on photographing owls. Thought we would post some more shots of the two Snowy Owls in the Meadowlands. Above, a Snowy flies near dusk on Friday. Below, you can see both owls in the same frame. 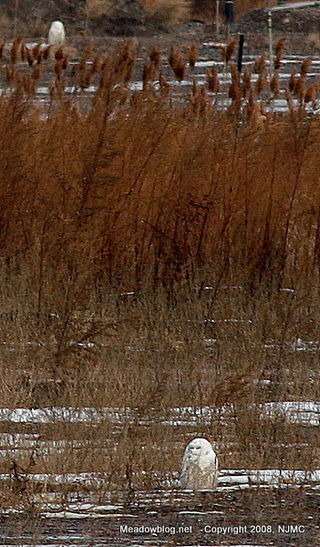 The white object in the upper-lefthand corner is the second owl. Both photos been enlarged greatly; they were taken with a 400-millimeter lens. The word is that heavy snows have severely reduced the number of lemmings on their home turf in the Arctic, and the Snowy Owls and moved south in search of prey on which to feed. That's one of the many reasons that it is important to stay away from these highly stressed and sometimes starving owls. Snowy Owls have also been seen elsewhere in New Jersey and in neighboring states in recent days. More on Snowy Owls here. SNOWY OWL UPDATE: TWO OWLS! 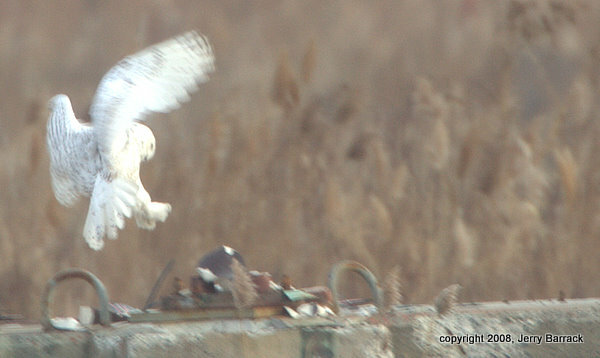 This morning there were two Snowy Owls in the Meadowlands. The photo above, taken this morning, is courtesy of Jerry Barrack. If you do see one of these amazing raptors, please keep your distance and do not trespass. These shots were taken through a telephoto lens. Click "Continue reading …" for more Snowy photos. The Meadowlands Commission has been installing tide gates along Berry's Creek in Rutherford and East Rutherford to reducing flooding in the surrounding area, including Route 17. The tide gates are paying another dividend — they are catching hundreds of cans and plastic bottles before they flow into the creek, and then into the Hackensack River. Where does all this litter come from? 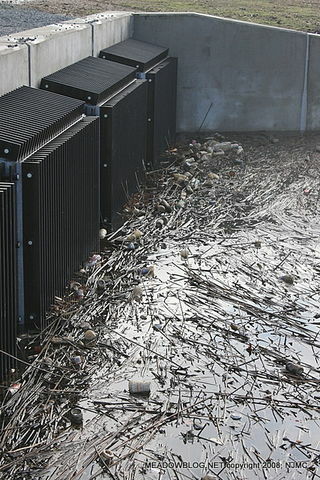 Thoughtless people throwing bottles and cans out their car windows or tossing them in storm drains. The next step in the tide-gate anti-litter effort: Setting up a program to recycle these materials.